One of the easiest ways to damage a home on the beautiful Gold Coast is by neglecting to properly clean and care for your gutters and downpipes. They may not seem important, but properly functioning gutters help carry water away from roof where excess moisture can lead to leaks, water damage and mould. Worse still? When leaf-filled gutters dry out during the hot summer months, the slightest spark can set them ablaze. We are currently in the process of completing our final verification checks for Gold Coast window cleaning companies. If you know a business who goes the extra mile, please nominate them. Since branching out from their original base of operations in Sydney, OZ has become one of the most trusted names in gutter-care on Australia’s eastern coast. Fast, reliable service has allowed them to not only retain a loyal customer-base, but use that base as a source of organic, grass-roots advertising. Gutters Blocked is adamant about how to clean gutters and as far as they’re concerned, doing it by hand or with a leaf-blower is a fool’s errand. Using an industrial strength wet-vac system, Gutters Blocked will remove not only leaves and light debris, but heavy mud and pooled water. The waste then travels into their large 205 litre containment drums to ensure the customer has to deal with no clean-up when Gutters Blocked leaves the worksite. 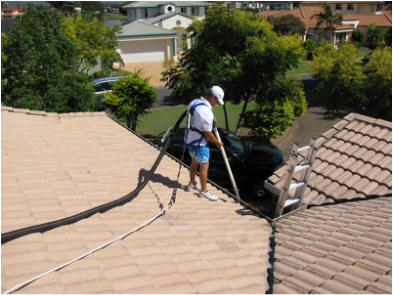 Providing professional cleaning service for the Gold Coast, GlobalVac will take on any clogged gutter whether attached to a single house, large apartment block, commercial business or industrial warehouse. Fully insured, registered with the Queensland government, and adamant about their employees usage of a rope/harness system for safety, GlobalVac has taken all the necessary measures to give potential customers ease of mind in hiring their services. Free quotes are available over the phone. As a family owned business, Goldsworthy Gold Coast Gutter Cleaning strives to treat each customer like a family member by focusing on delivering reliable, trustworthy service. Using a vacuum-based method of cleaning, Goldsworthy believes their services will not only mitigate the risk of storm-water overflow and damage, but substantially lower the likelihood of a devastating house-fire during the dry, summer months. Based in a central Gold Coast location, Goldsworthy delivers for customers of all shapes and sizes throughout the region. By using heavy duty vacuuming equipment, Goldsworthy follows a growing industry trend which seeks to replace the more traditional methods of gutter cleaning by hand or water pressure with more modern, suction-based techniques. When it comes to protecting house and home, few appreciate the importance of having clear gutters and drainpipes like Goldsworthy. Yes, blockages can cause water to seep inside walls and ceilings but the cautious, family-first people at Goldsworthy also care to remind their clients about the commonly overlooked fire danger arising from leaf-littered gutters. Time efficient service thanks to the use of commercial grade equipment. A strict adherence to a “No-Mess” policy—Goldsworthy pledges to leave your space as clean as it was when they arrived. Roof washing and cleaning available. Easy access pricing guide available on the Goldsworthy website. Neighbourhood specials featuring discounts of up to 20% off. Take a look at our top 6 Window Cleaning Companies on the Gold Coast.